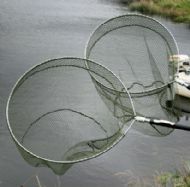 These range of nets are manufactured exactly same way as our other Sea Tout and Trout nets. The only difference is that instead of using our traditional net mesh, they have a soft net mesh; both net mesh are fish friendly. They come in 3 different shaped net frames. The round Belmont, the "D" shaped Seaforth and, finally, the bow shaped. The net bag is a woven combination of D210, D400 and D600 polyester that is both strong, yet soft to touch and is mildew resistance. It is resistant to stretching, shrinking and resists pilling (bobbling). The photograph show both the Lakeside 16 and Lakeside 20 with these net bags on Belmont Frames.